Preheat the oven to 200°C/180°C Fan/Gas mark 6. Line a baking tray with kitchen foil and lightly spray with Frylight. Mix together the grated parmesan, cooked quinoa and sesame seeds in a bowl and season lightly with salt and pepper. Spread out the mixture on a plate. 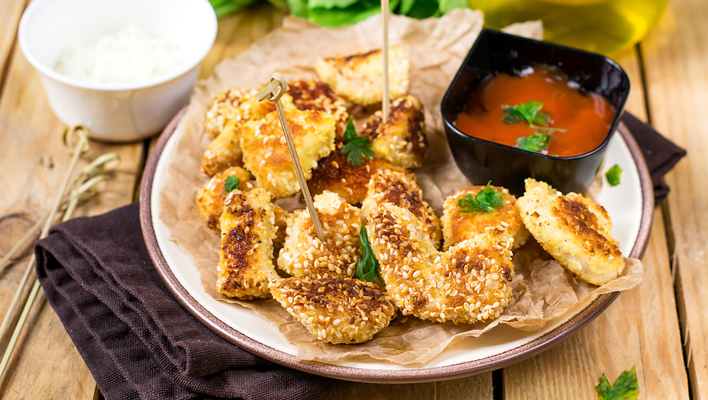 Dip the chicken strips into the beaten egg and then roll them in the quinoa mixture until evenly coated all over. Place them on the baking tray and lightly spray with Frylight. Bake in the oven for 25 minutes, turning the goujons halfway through, until crisp and golden brown. Heat the sesame oil in a wok over a medium heat. Add the garlic and chilli and cook for 1 minute. Add the chicken and cook for 3-4 minutes, stirring regularly. Add the stir fry vegetables and mix well. Stir-fry for 3 minutes until the vegetables are starting to soften but are still crisp. 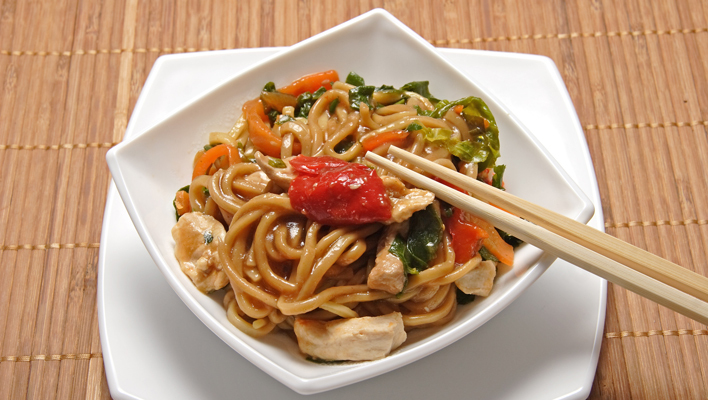 Stir in the noodles and sauce, and stir-fry for 2 minutes until piping hot. Serve immediately in warm bowls sprinkled with fresh coriander (if using). Lightly spray a large frying pan with Frylight and place over a medium to high heat. Cut each chicken breast in half lengthways, to create four thinner fillets. Place on the pan with the chorizo slices and cook 3-4 minutes on each side, until the chicken is no longer pink in the middle. Meanwhile, lightly spray a griddle pan with Frylight and place over a medium heat. Place all of the bun halves face down on the pan and heat through for 2 minutes until charred. Spread the top and bottom of each bun with 1 tsp of light mayonnaise, then top the base with the salad leaves, chicken breast and chorizo slices. 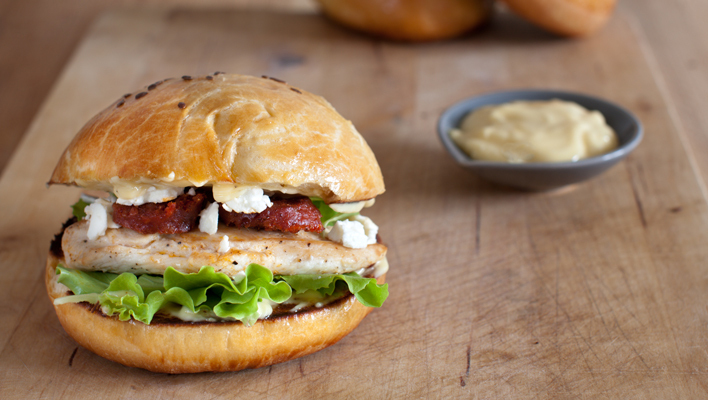 Crumble 15g of the feta over each burger, then sandwich together with the top of the burger bun. Serve with a large salad. Pre-heat the grill to medium. Line a baking tray with foil and spray with Frylight. Scatter the chicken strips on the tray and place under the grill for 10 minutes until cooked through and golden. Meanwhile, lightly spray a large frying pan with Frylight and place over a medium to high heat. Add the onion and garlic and cook for 2-3 minutes, until the onion starts to soften. Bring a pan of water to the boil and cook the pasta according to the pack instructions. Add the tomato halves to the tray with the chicken and place back under the grill. Add the wine to the onion and garlic and cook for 1-2 minutes to allow the alcohol to burn off, stirring regularly. Add the crème fraîche and a tbsp of water and heat through for 1-2 minutes. Season generously with black pepper. Drain the pasta then add to the sauce and thoroughly coat. 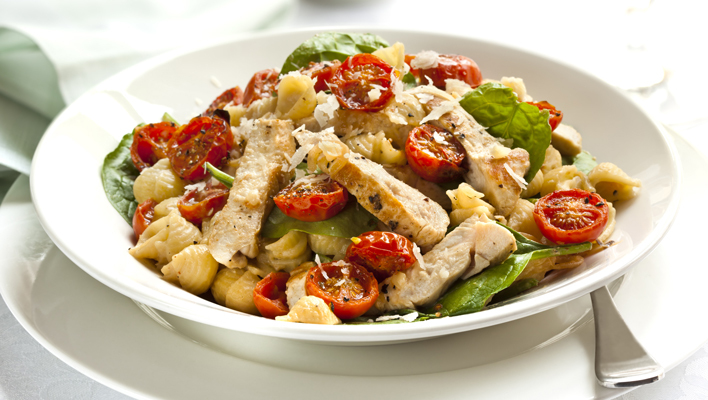 Mix in the spinach leaves, grilled tomato and chicken. Serve in bowls topped with parmesan shavings. Preheat the oven to 200°C/180°C Fan/Gas mark 6. 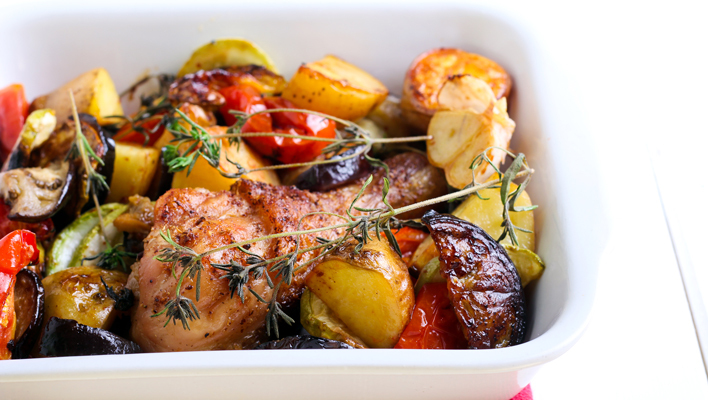 Spray a large roasting tin or casserole dish with Frylight. Scatter the potatoes and chicken in the tin, drizzle with the olive oil and season with salt and pepper. Mix everything together so the potatoes and chicken are well coated in oil. Ensure the potatoes and chicken are in one layer, add the garlic and bake for 30 minutes. Remove from the oven, add the aubergine, tomatoes and lemon slices to the dish and mix everything together. Top with the rosemary and return to the oven for 15 minutes. Ensure the chicken is cooked through and potatoes have softened. Remove the garlic and lemon before serving. Enjoy!